Today is the 70th birthday of our dear singer Ghantasala. He was born on December 4, 1922 in a village not far from Vijayawada. He died over 18 years ago, on February 11, 1974, but his voice and his songs are immortal. His songs are a dear treasure to every Andhra. 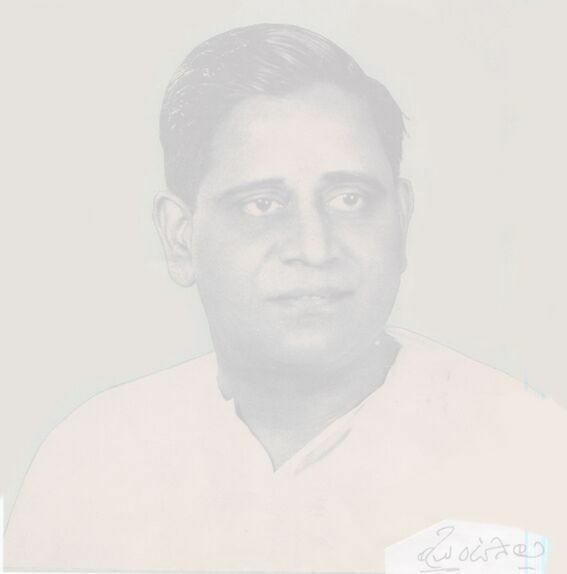 Ghantasala started his playback career with the movie "Swarga Seema" in 1947. Nagayya was the music director of this film. Within a couple of years, Ghantasala started composing film music - his first was "Keelu Gurram". The song "Kadu suma, kala kadu suma" (with Vakkalanka Sarala) was, according to my father, a very popular song in those days. His career, both as a singer and as a music director, got a boost with the famous "Pathala Bhairavi" directed by K.V. Reddy and produced by Nagi Reddy and Chakrapani. The songs "Kalavara maye madilo", "Enta ghatu premayo", "Hayiga manakinka swechhaga" from this movie are dearly cherished even today. Ever since, Ghantasala composed music to nearly 100 films, and sang about 10000 songs until his death in 1974. The notable movies to which he gave music are: Pathala Bhairavi, Pelli chesi chudu, Shavukaru, Maya bazaar, Lavakusa, and Gundamma Katha. Apparently, Pendyala was first approached to score music for "Lavakusa". But he demanded too high a remuneration, and the producers decided to go for Ghantasala. Recalling this (in a conversation I had with him when I invited him to IIT Madras in 1983), Pendyala told me that he was happy about what had happened - he could not have matched Ghantasala's performance for Lavakusa. Needless to say, it reflects on the divinity and the serenity of the songs in Lavakusa, and on the humility of Pendyala, unquestionably one of the best film composers. Besides film music direction, Ghantasala composed music for Bhagavat Gita, Pushpa Vilapam, Kunti Kumari, Goghosha, several devotional songs on Venkateswara Swamy, songs on freedom movement (in which he participated), and several Palle Patalu (e.g., Ravoyi bangaru mama, Atta leni kodalu). In essence, Ghantasala had enough works to be put on par with the all time great Indian film composers such as Pendyala, Rajeswara Rao, Naushad, S.D. Burman etc. It may even be argued that he exhibited a greater versatility than some of them. There is hardly a need to elaborate on Ghantasala as a singer. But, given my passion for his songs, I'll do it anyway. His voice was his great asset. Added to that was his ability to blend the right expression effortlessly and most naturally into the song. Consider for instance "Kudi yeda mayithe" or "Jagame maya" from "Devadasu", or "Kala kanidi, viluvainadi" from "Velugu needalu", or "Manasuna Manasai" from "Doctor Chakravarthi". The expression of sadness, despair, and detachment in these songs is most natural and real - he finds no need for extraneous sounds or gimmicks to evoke the right emotion. Consider "Enta Ghatu Premayo" from "Pathala Bhairavi", or "Evarivo Echata nuntivo" from "Chandra Haram", or "Andame Anandam" from "Bratuku Theruvu". I wonder whether there is ever a better expression of "Bhavukatha" than what one can find in these songs. Consider "Edu kondala samy" (a private record), or "Mahesa Papavinasa" from "Kalahasthi Mahatyam", or "Thaguna, Varameeya" from "Bhu-Kailas". Can we think of songs in which "Bhakti" is better expressed? Consider his private songs "Atta leni kodalu uttamuralu", "Ravoyi bangaru mava", "Police Venkatasamy, ninnu nenu maruva lenura" - these, more or less, define the once typical village atmosphere and "Telugudanam" to the present-day city dweller. His grasp on music, on Telugu Bhasha, and its culture are all simultaneously evident from the way he rendered Karunasri's "Pushpa vilapam" and "Kunti Kumari". I know people who stopped plucking flowers (in fact, even using them) after they heard "Pushpavilapam". In general, he had an excellent understanding of the old drama style. This is clear from his rendition of Telugu Padyalu and Samskrita slokalu in Pouranika movies. Consider "Siva Sankari, Sivananda Lahari" from "Jagadeka Veeruni Katha", or "Rasikaraja thaguvaramukama" from "Jayabheri", or the "Ashtapadulu" from "Bhaktha Jayadeva". These are all instances of classical music in films. Ghantasala sang these as well as any classical musician could have. With his voice and expression, perhaps he even sang them better than most classical musicians. Last, but surely not the least, are his relatively light-hearted songs, especially his duets with Ganakokila Suseela. "Konda gali thirigindi" from "Uyyala Jampala", "Idemi lahiri, Idemi garadi" from "Idu-jodu", "Vadinapule vikasinchele" from "Mangalya Balam", "Madhuram madhuram ee samayam" from "Bharya-bhartalu" - and of course many many more, are ever-greens. There have been many film singers - S.P. Balasubramaniam, Jesudas, P.B. Srinivas, A.M. Raja, and T.M. Soundararajan in the south, and Mohammed Rafi, Kishore Kumar, Mukesh, Saigal, Mannade, Hemanth Kumar, and Talat in the north - are perhaps the most notable ones among the males. Although each singer in this list has his own charm and distinctive style, they are hardly comparable to Ghantasala. For one thing, none of them is accomplished as a music director (A.M. Raja, S.P, and Hemanth Kumar did compose music to some films, but are surely a notch below Ghantasala in this department). Even as singers, when you put together the assets of Ghantasala - his voice, expression, range, ability for pure classical music, and the lightness of voice when required, the rest are hardly a match. In this context, it is gratifying that Andhras do take a lot of pride in their Ghantasala and commemorate his birthday. I hear from my relatives that every year music competitions are held in the name of Ghantasala throughout the state during the period Dec 4 to Feb 11 (the date of his demise). The AIR and Doordarshan used to devote these two days to play exclusively his songs. I am sad to learn that AIR stopped this practice. Last year, S.P. Balasubramaniam celebrated his 25th year as a playback singer by installing a bronze statue of Ghantasala in Ravindra Bharati in Hyderabad. A later posting by Gopal makes the following corrections Sorry to nitpick but there are a few corrections. 'SwargaSeema was released in 1945 and is based on G.B.Shaw's 'Pygmalion'.Also 'Keelu Gurram' if I remember correctly was his 'third' film as a music composer but I am yet to find out the first movie for which he composed music.